LCA, Environmental footprints and intelligent analysis for the rail in- frastructure construction sector. Entity: European Commission, LIFE 2012 FP7. Execution period: 1/10/2013 – 31/3/2017. OPTIRAIL: Development of a Smart Framework based on Knowledge to Support Infrastructure Maintenance Decisions in Railway Corridors. Execution period: 1/10/2012 – 30/9/2015. Execution period: 1/1/2017 – 31/12/2019. Execution period: 30/1/2014 – 30/1/2018. 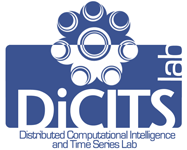 An integrated approach based on flexible computation for the analysis and modeling of time series. Data mining in Cloud Computing for e-learning. Execution period: 10/4/2012 – 31/12/2012. Management and maintenance of railway infrastructures: GEOMAF. Time Series Modeling and prediction using soft computing techniques. Execution period: 1/1/2010 – 31/12/2012. Conservation of infrastructures based on computational intelligence (CIBIC). Execution period: 1/7/2009 – 31/12/2010. Computational Intelligence Techniques applied to the development and implementation of algorithms to tackle calculating resource optimization in regular bus transportation companies. Execution period: 15/10/2015 – 15/3/2016. Application of Computational Intelligence and Data Mining techniques for data analysis of railway lines. Execution period: 1/10/2013 – 31/1/2015. Application of computational intelligence and data mining techniques for crop prediction and disease propagation. Execution period: 1/10/2013 – 30/9/2014. Development of a cloud platform (APLACA). Execution period: 1/12/2011 – 31/5/2013. Execution period: 10/7/2011 – 10/10/2013. Execution period: 15/5/2013 – 31/12/2013. Research on the development of a Health Monitoring System, based on data mining techniques and PDR computational intelligence. Execution period: 15/11/2012 – 30/4/2013. Computer Sciences applied to an SME (institutional real estate developer: regional administration): administration, security, design, development and communication. Execution period: 1/12/2004 – 30/11/2005. Development of a laboratory automation system and research support. Execution period: 1/9/2001 – 31/8/2002. Application of flexible computing techniques to the classification of olive oils.